“So, things are not good on ‘the romantic front’ presently, I hear you say?” Well, fear not, all is not totally lost; as Mr Gerard Fogarty (Deputy Officer in charge – Order of Malta Ireland Ambulance Corps, Thurles), now reports. 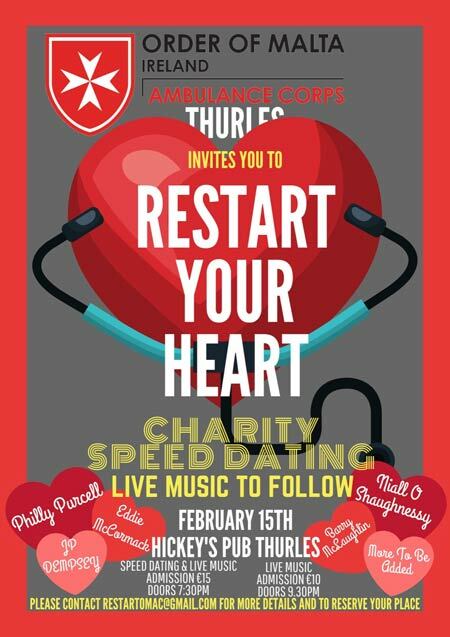 Allow us to “Restart Your Heart”, with our charity speed-dating event in Hickey’s Bar, Cathedral Street, Thurles on Friday, February 15th. Get that ‘loving feeling’ with kick-off at 7.30pm. Note: Spread the “St. Valentine’s Weekend Cheer” by inviting all of your single friends. Register online to restartomac@gmail.com to ensure your place. Let Friday night next, take you into those early hours with an exciting live music line-up, from local talent’s Niall O’Shaughnessy, Barry MacLoughlin, JP Dempsey, Philly Purcell and Eddie MacCormac. Music will start at 9.30pm. Admission for dating and music €15. Admission for music only €10. Total proceeds will go to Order of Malta Ireland Ambulance Corps Thurles, whose volunteers provide patient transport, first aid courses, and first-aid for events all across Mid-Tipperary.